« Do cultural differences impact tribe behaviors in #socialmedia? Understandably so, as these type of messages are not personal and actually quite annoying. It gets even worse when an AutoDM is a self promotion to “Like” a Facebook page, or an invite to “connect” on LinkedIn. But the biggest FAILWHALE goes to those AutoDMs which are pointing you to some promotion site!! is there such thing as a good AutoDM? This joke is just too funny, and something you wouldn’t expect to suddenly land in you Twitter DM box. It put a big smile on my face and I tweeted it to my followers immediately. I got many positive responses of other people loving it too! YES, you can have a successful AutoDM message! Just make it fun, memorable, worthwhile and remarkable! Or spice it up more by using a creative ifttt.com autoreply? Like a random quote generator in your mail? On behalf of the Irish, thumbs down. I’m always torn about this. I do like to send a DM (I have 5 or 6 that I have pre-programmed to rotate) out of a set I created that invites people to listen to music or perhaps check out a video blog so they can know more about who I am, because as a music artist, my music speaks about who I am. I haven’t turned mine off. I don’t think it’s very offensive as it’s just an invitation and it is really up to the person as to whether they click or not. I’m hoping they are following me because of my music or hearing about it, so I feel like directing them to my Video Blog series or directly to my music page isn’t such a bad thing. What do you think Thomas? Cheers and thanks for the blog post! Thanks for taking the time to leave your comment Natalie! I must say I do find putting a link in an autoDM very tricky, and would never do it myself. I usually unfollow accounts that do this. What I think works much better is to send an @reply message with a welcome. Sure its more time consuming, however its more effective and more personal. I did try the @reply to all new followers, aside from it being incredibly time consuming, a few people tweeted back to me and said that it was in bad taste to do that (so, not effective) and then my followers chimed in about how they didn’t like that I tweeted new follower greetings so much! So I feel at a real loss. I am not sure that the Auto DM has effected me so badly. I just don’t know. I’m so on the fence about it. It’s difficult to know why people follow these days, esp. with so many bots or people following those who have over 1K followers. I’m sooooo confused! Did it put you completely off when you got mine? BTW I can understand if someone leaves a link to a promo site or a selling site… but what about if the site just tells more about you than the Twitter bio allows, or if it might have another window into that person? I’m just wondering why people automatically think a link will lead to ‘bad things’? Auto DMs are just not imaginative enough. 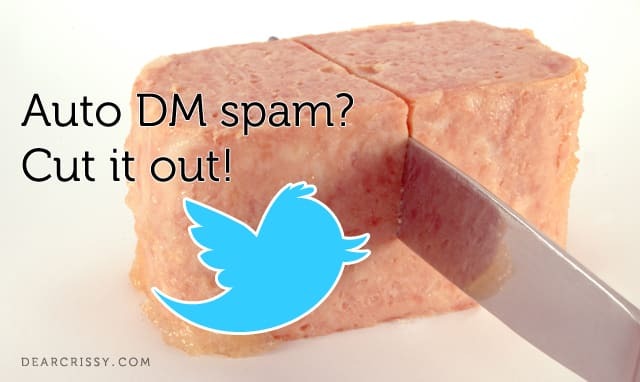 The static and entirely unoriginal rein supreme when it comes to auto DMs and that’s why I’ve stayed away from them and, if they are simply linking me into some promo site, I quite often unfollow the person that sent it, simply on principle. So, what is the consensus? No personal @ replies to each new follow? No auto DM either? Ignore them? Or just resort to spending lots of time personally responding via DM? Let me start by saying I am NOT a fan of auto DM’s. Usually they add no value whatsoever and don’t contribute to a sense of bonding with the other person. There are, however, situations in which they can be quite useful. We’ve notices that this auto-DM is actually very usefull and quite a few people have reacted in a positive way, telling us it is considerate of us to enable the DM in this way and explaining why we do it using DM. I usually ask a question. What is important to you? Can I tweet to my group anything you find interesting/important? It comes down to showing interest in someone you value.